Vologases was the greatest of the five kings who would bear his name, although Parthia was troubled throughout his reign on both its eastern and western borders. He was the son of Vonoses II, a one-time monarch of Media Atropatene. His mother was reportedly a Greek concubine. Vonones was replaced by Vologases in 51, with the consent of his two brothers, Tiridates (of Armenia) and Pacorus, both of whom expected their own kingdoms. Pacorus was given the ancestral domain of Media, and Tiridates received the often contested realm of Armenia. Parthian armies then swept into Armenia and placed Tiridates in firm control, precipitating over a decade of hostilities with Rome. 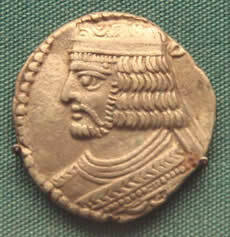 Corbulo was sent by Nero to the East in 55, and in 58 Tiridates was ousted. Vologases could not exert his full strength during the crisis because of troubles in the East, but by 62, the Roman client Tigranes V had fallen. Negotiations were favored over battle, despite the Parthian victory over Paetus. Tiridates journeyed to Rome in 66 and was crowned by Nero. Relative peace followed between Parthia and Rome, especially in the reign of Nero. Vespasian had Vologases’s backing in 69, and the emperor even pondered sending him troops to aid in the defeat of the barbarian Alans. Better relations allowed domestic opportunities, as Vologases founded the city of Vologesia as a rival to Seleucia. He was followed on the throne by his Son Pacorus II.